regeneration zone – shallow water zone with numerous plants which have filtrating features. Additionally installation of circulating pump or airing pump is highly recommended. 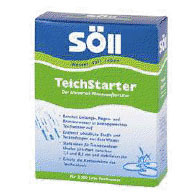 You can use TeichStarter to condition water (tap water, rain water or well water) up to the level which complies with biotope of pond water; to bond harmful substances, chloride or heavy metals which can have negative influence on pond life, also to increase temporary hardness (pH value doesn’t fluctuate). conditions for all pond occupants and proper climate for lively shinny fishes. corrosion and lime settling. Well water may contain even up to 4 times more phosphates. 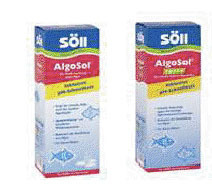 advantage during absorbing nutritious substances (food, pollens, sludge, etc). algae can increase. 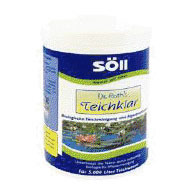 1 kg of algae can arise from 0,1g of phosphates!!! Purified zeolite or ZeoSpeed are recommended agents which bond phosphates. algae growth. It has to be applied on a regular basis every 6 weeks. 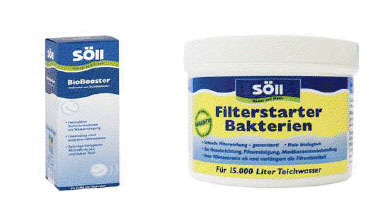 not installed, biological life of the pond may be made alive by using of bacterial starters. 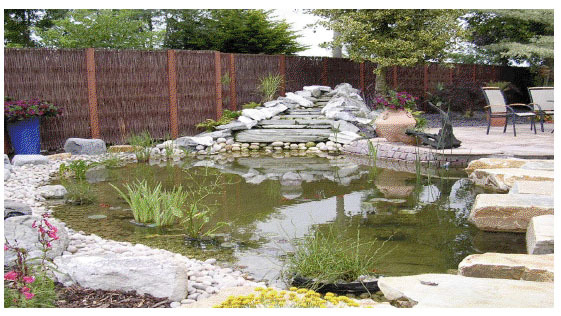 pond after 6-8 weeks. Bacteria starter shortens this period to 1 week. In case of ponds not equipped in filtrating system it is highly recommended to use Dr.
agent it is necessary to switch of the UVC lamp. Lamp can be again switched on after 48 hrs. time consuming to control its growth. At the moment there are over 100 000 known algae. The most common are: suspension algae, cyanobacteria, flagellates and filamentous algae. protects reservoir against its growth. 24hrs after or before application of TeichFit.